That's the Pinguin, a three-wheeled postwar German microcar that was one of several that used the Porsche as inspiration. It was built by an agricultural machinery company and was pretty forward thinking for its day. 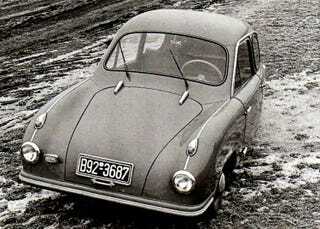 It was designed by Kurt Volkharth who had worked on the Opel Rocket Car back in the 20's. The aluminum streamlined body was wind tunnel tested and had a drag coefficient of 0.403 which sounds pretty good to me. It also had independent front suspension and many accoutrements other micros lacked like dual, motorized windshield wipers, indicators on the fenders, and an ashtray. But, the chassis was made of matchsticks which called for a complete redesign just as the car was set to debut. Pinguin hired Norbert Stevenson of Fuldamobil fame to pen a new chassis which apparently worked great and the light, little car was said to handle better than anything its size. It was powered by the same Sachs 200cc two-stroke that gave the Messerschmitt its go and it was said it would run at 50 mph all day with little effort. Unfortunately, Pinguin had already sunk an unrecoverable amount of money into the car and only 12 were ever built between 1953 and 54 before they went under. None of them survive today.